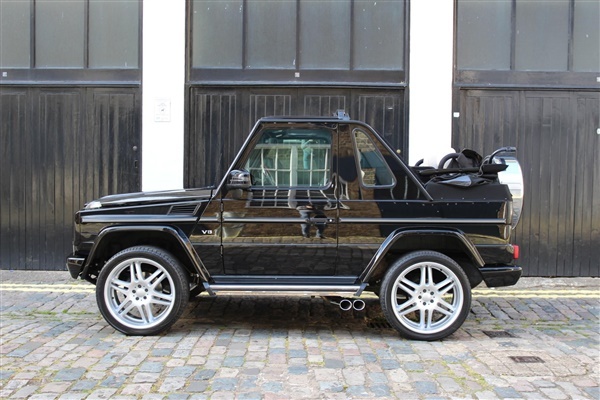 LOW MILEAGE EXAMPLE ++ AVAILABLE NOW ++ FINANCE AVAILABLE ++ FULL MERCEDES SERVICE HISTORY ++ We are pleased to offer this Rare Mercedes-Benz G500 Convertible in Black with Designo Porcelain Leather Interior. The spec includes Electronic Stability Control, Stainless Steel Door Sill Panels Illuminated, Media Interface, Comand APS, Anti Theft Alarm System, Automatic 7G- Tronic Transmission, Seat Heating for Drive & Front Passenger, Ultrasonic Reversing Aid, Seat Comfort Package, Cabriolet Soft Top in Black, Rear Mud Flaps, 18" Light Alloy Wheels 6 Spoke Design, Multicontour Driver & Passenger Seats, Seat Ventilation for Driver & Front Passenger, Leather Interior, Leather/Burr Walnut Steering Wheel & Selector Lever, High Gloss Burr Walnut Trim, DVD for Comand APS Operating & Display System, Designo Leather in Porcelain. For an appointment to view please call on ***. AVAILABLE NOW ++ FINANCE AVAILABLE ++ , Black, £179,950. This advert is for a Mercedes-Benz G Class, click Mercedes-Benz G Class in Marylebone to see more cars like this in the local area. Want to search further afield? Click Mercedes-Benz G Class in West Central London to search for similar cars in the wider West Central London area.